Although the poker arcade game video poker is something that has appeared over the past few decades, when it come to the origin of the game of poker, it would appear that opinions are divided here at Blitz Arcade as to where it actually came from. There are those that are of the opinion that it was derived from the Persian game called As Nas, however this notion is challenged in so far as there was a French game called Poque along the same lines of Poker. This in turn was possibly derived from the Irish 'poca' which in turn is thought to have come from the German word pochen, meaning to 'brag'. You would think that at this point that this would now take its roots back to the English game of Brag, but this came from the 17th. Century French game Brelan. 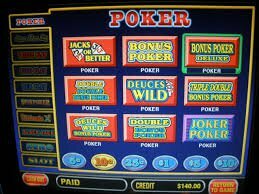 One thing we know for sure is video poker, the poker arcade game, definitely comes from poker, of that there can be no doubt! Unlike the original table version, the poker arcade version can be played at your own speed. This is one of the great things about playing video Poker. When you play the table game there can be several players, especially if you are involved in a game. Of course playing the original game, involves you in the social aspects with all the unravelling, emotional ups and downs, and is without doubt a game for the keen observer of body language and the likes, video Poker, lives in a world of its own. Perhaps, the only game that could rival it is arcade blackjack , which, like poker, requires some level of skill to play. 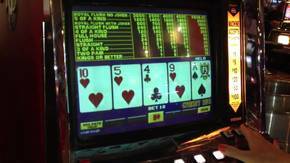 With video Poker, you have a button to cue the action. Once your bet is placed you need to generate a hand. This you do by pressing the deal button. You may be dealt ten cards, or you may be dealt 5 cards, if you are dealt five, then you press again for more cards for you to complete your hand. The cards you wish to keep, you hold on to, those you don't you throw away. As you discard the cards you wish to throw away, they are instantly replaced with new ones, and you hope that you will now have a winning hand. One of the most popular arcade games you will find will be Jacks or better. This allows you the best pay out possible. None the less, should you prefer to play one of the other versions, they are readily available to you by looking and should be easy to find.